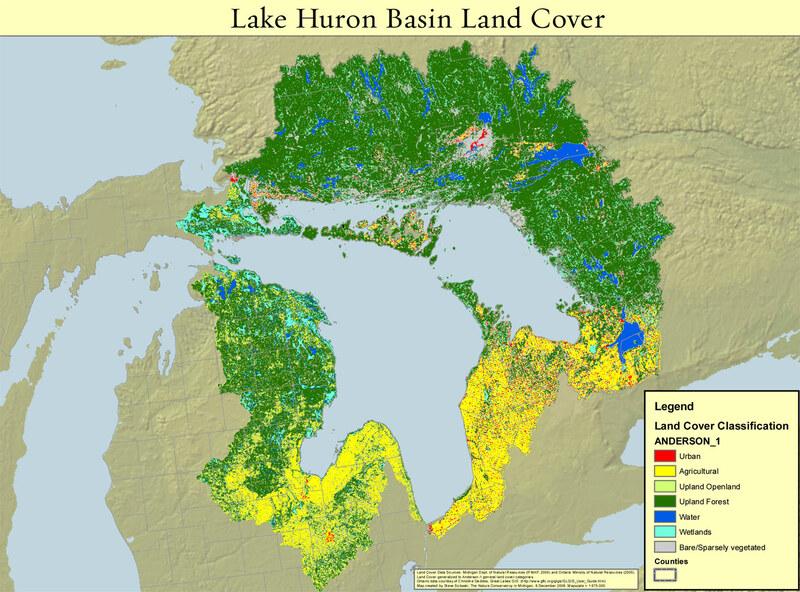 Lake Huron has the largest watershed area and the longest shoreline of all the Great Lakes. It is the second largest of the Great Lakes by surface area, third largest by volume, and the fifth largest lake in the world. Four interacting bodies of water make up Lake Huron; the North Channel, Georgian Bay, Main Basin, and Saginaw Bay (Michigan). Lake Huron is unique among the Great Lakes as it receives much of its water from two other large lakes; Lake Michigan and Lake Superior. 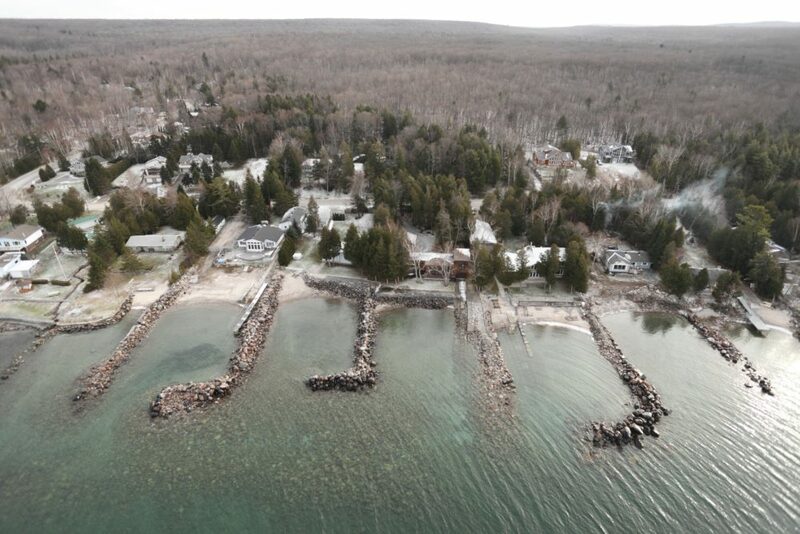 Each hour, approximately 5.4 billion litres of water flows from Lake Michigan through the Straits of Mackinac. Another 8 billion liters of water flows from Lake Superior through the St. Marys River. The watershed itself contributes about 10.4 billion liters of water from the surrounding land and streams. 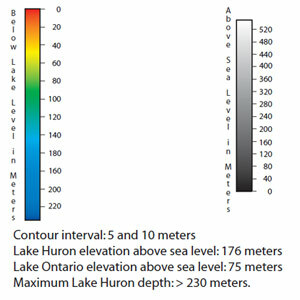 If you emptied the water in Lake Huron on to the land of its watershed, it would cover the land to a depth of over 25 meters (85 feet). Ontario drainage basin area: 91,100 sq. km. Georgian Bay was the first of the Great Lakes waters to be discovered by French explorers. The features and land use activities in the watershed differ significantly between the north and south and directly influence the water chemistry, water quantity, and overall water quality. The rocky shores associated with the Precambrian shield cover the northern and eastern shores of Georgian Bay and the North Channel. 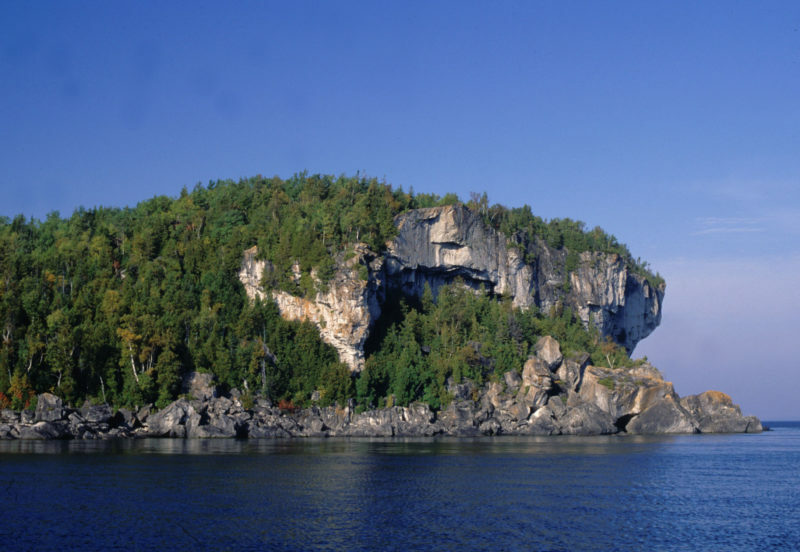 Limestone dominates the shores of Manitoulin Island (the largest freshwater island in the world), the northern shore of the Bruce Peninsula and the north shore as well as Lake Huron’s mid-lake reefs. The Lake Huron basin is heavily forested in the north with some of the largest tracts of Great-Lakes St. Lawrence mixed-wood forest that provide critical habitat to a diverse array of plant communities and wildlife. 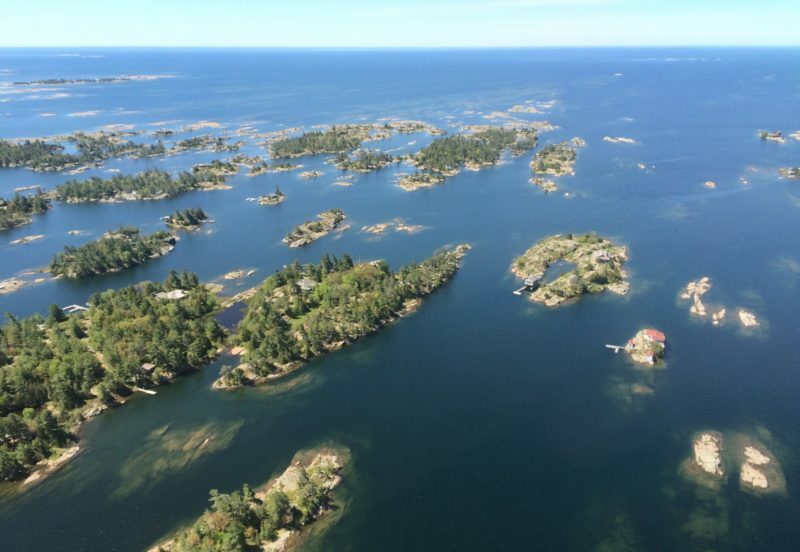 Most of the 30,000 islands that dot the lake are found in the north and create complex shorelines with shallow warm waters that support some of the most abundant and pristine coastal wetlands in the Great Lakes Basin. In the south, glacial deposits of sand, gravel, and till predominate. 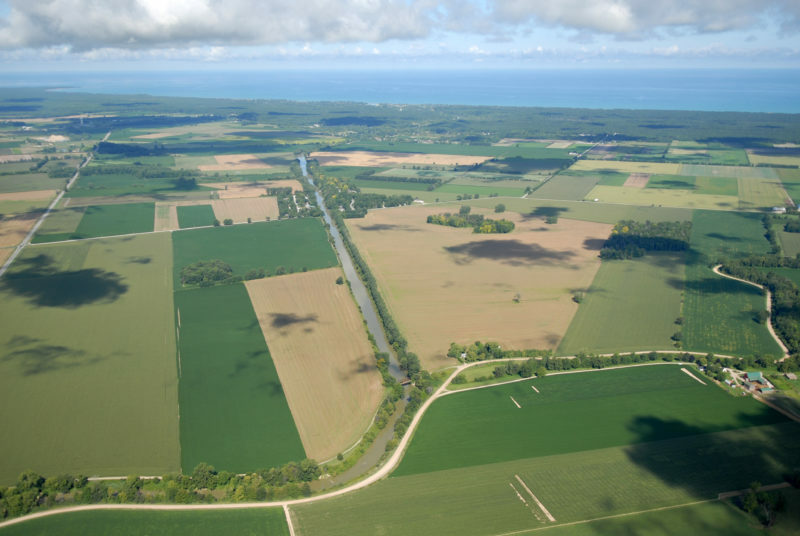 Much of the Bruce Peninsula and the southeast shore of the Main Basin are dominated by agricultural land use (e.g., field crops) and support many beef and dairy farms. Shorelines here are home to some of the longest freshwater beaches in the world (Wasaga and Sauble) with fragile dune systems and rare and endangered species. Important remnants of Carolinian forest are found in the southern-most portion of the watershed. The Carolinian ecozone contains 2,200 plant, 70 tree and 400 bird species as well as a third of Canada’s rare and endangered species; many of which are not found anywhere else in Canada. Over the past 250 years of development, the Carolinian forest has been reduced to a small portion of its original area. 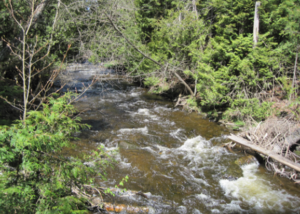 Throughout the Canadian watershed, approximately 1,334 streams act as conduits for drainage waters, nutrients, and sediment from the watershed to the lake. 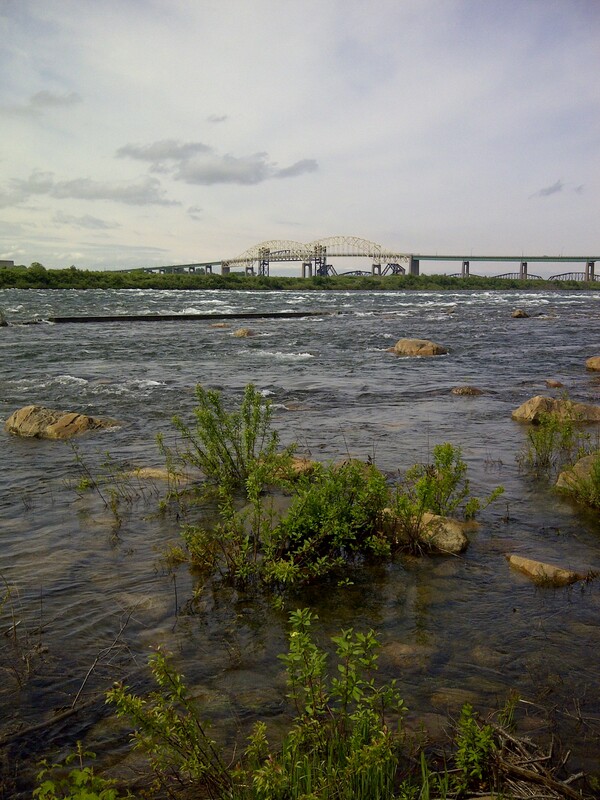 Major Canadian Rivers include the St. Marys, Spanish, French, Nottawasaga, Beaver, Sauble, Saugeen, Maitland, and Ausable. Cold and warm headwater streams contribute to biodiversity and the health and function of Lake Huron. Rivers and streams are highly vulnerable to land use changes, re-engineering and in rural areas, livestock access. 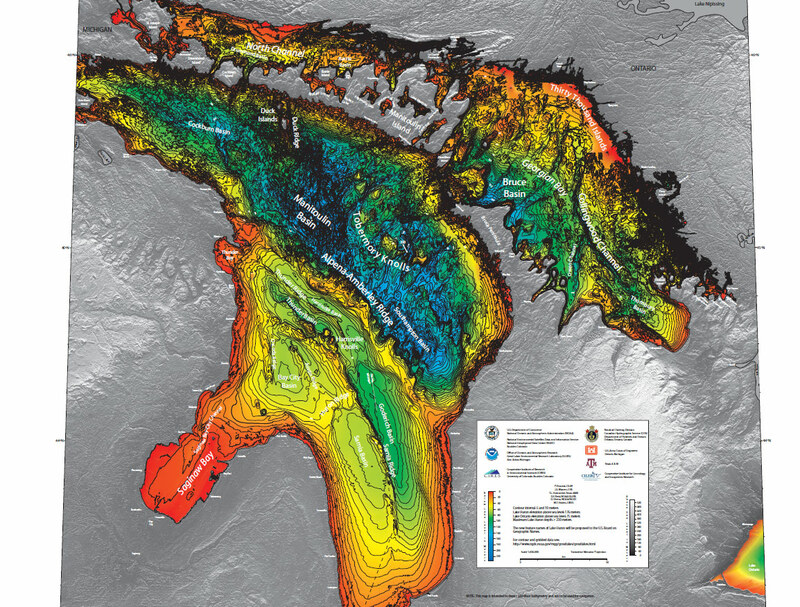 What lies beneath Lake Huron is equally impressive. Thousands of shoals, knolls, and deep basins and channels are associated with glacial scouring activity. 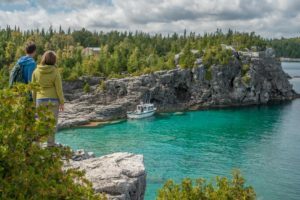 Scattered throughout the lake are hundreds of shipwrecks that reveal a rich maritime history; many of which are found in shallow waters of the Bruce Peninsula near Tobermory. These portals into Lake Huron’s history invite residents and visitors to explore the diverse natural and cultural history of the lake. 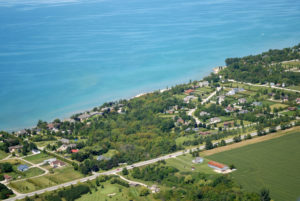 Lake Huron’s central location within the Great Lakes has long made it an ideal location for human settlement and trade. Indigenous people served as some of the earliest caretakers of the land and water of Lake Huron, acting on the belief that water is life and part of an interconnected web that must be treated with the utmost respect and care. Evidence of a long Indigenous People’s history is found beneath Lake Huron on the Alpena-Amberley Ridge, where researchers discovered ancient caribou hunting structures used by inhabitants over 9000 years ago. The Anishinaabeg/Anishinabek people (“The Original People) have used their traditional territories for as long as 15,000 years; living and moving throughout the landscape that would have been considerably different than present day. In the southern portions of the watershed, the Wendat (Wendake, or Huron Nation) resided in large palisaded villages of 10,000-30,000 inhabitants with sophisticated agricultural systems. 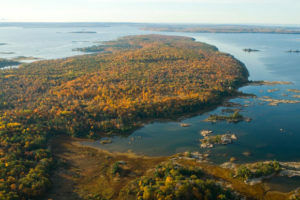 When the early French explorers, Samuel de Champlain and Étienne Brûlé, arrived on the shores of Georgian Bay in 1615, they named this vast water body La Mer Douce (the Sweetwater Sea). 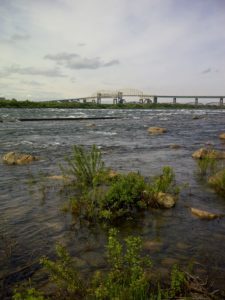 Brûlé traveled north as far as the great rapids of Sault Ste. Marie, where he found the well-established villages of the Anishinaabeg / Anishinabek people. To the south, the French came upon the land of the Wendat hemmed between Lake Simcoe and southern Georgian Bay. It was here that French Jesuits established Sainte-Marie among the Hurons located near modern day Midland as the first European settlement and base of operations for French Jesuit missionaries in 1639. The mission was burned in 1649 and the Wendat dispersed following disease, Iroquois (Haudenosaunee) aggression and war. In the 1700s, French and Scottish fur traders married Indigenous women. Their descendants form a distinct history, culture, language, and territory connected along the fur trade routes and waterways and this culture exists today as the Métis Nation. Spread across Ontario, Indigenous culture, traditions, and values continue to link communities to these lands and waters. 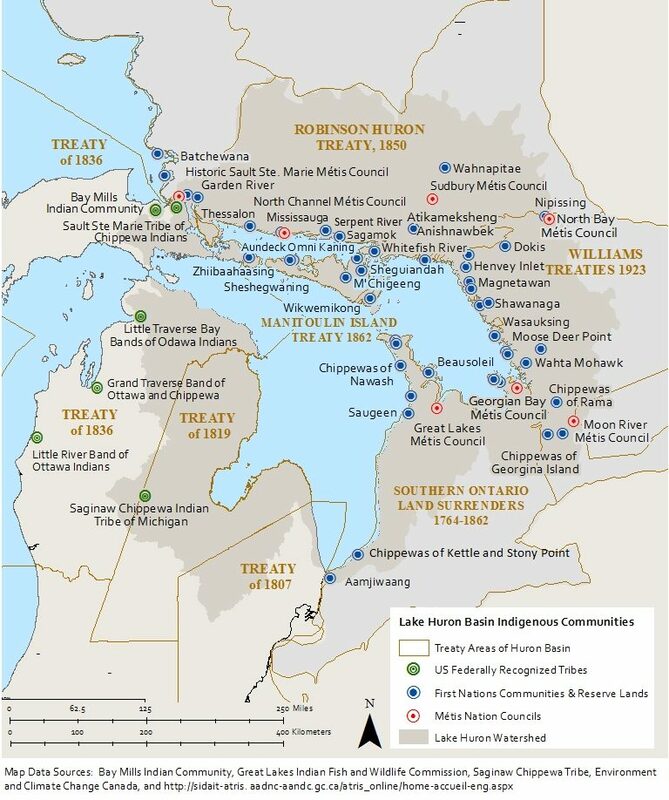 There are currently over 25 First Nation communities found within the Ontario watershed of Lake Huron and several Métis Nations. Click the map to view Ontario’s First Nation communities, Tribal Councils, reserves, and land covered by specific treaties. 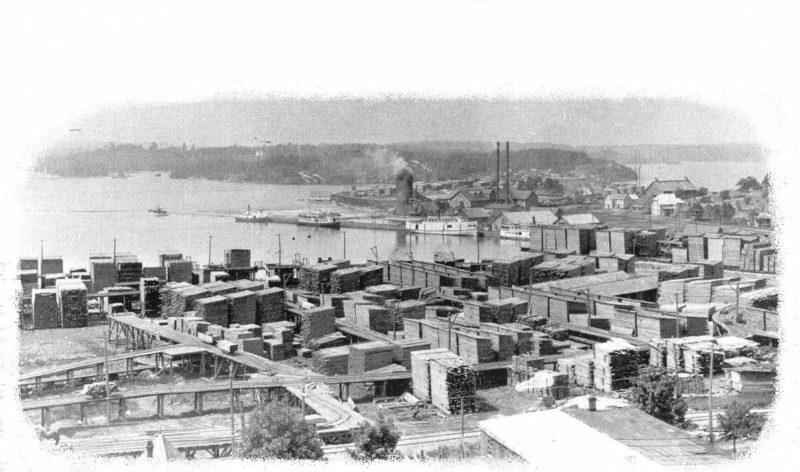 Early commercial activities in the north were driven by the lumber industry which took advantage of the plentiful supplies of spruce, pine, maple and oak which resulting in the development of sawmills, other businesses, and eventually villages. 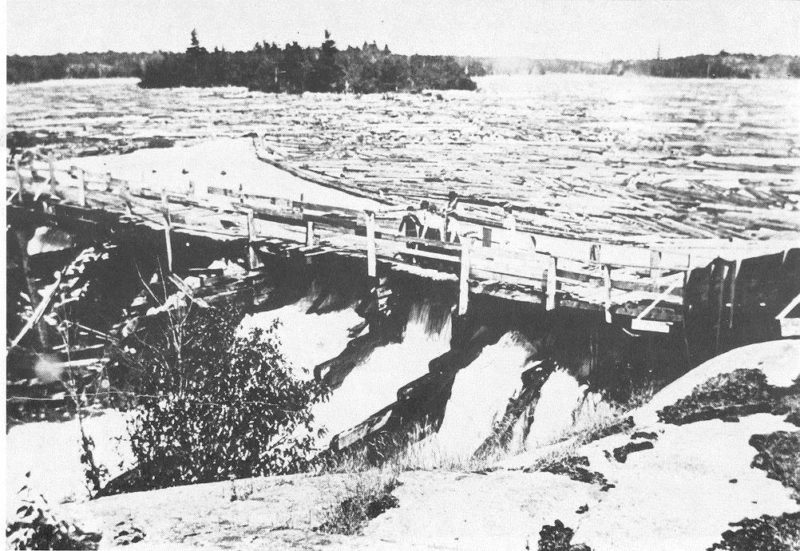 With the arrival of the CPR in the late 1800’s, logging companies expanded north to harvest the vast pine forests surrounding Georgian Bay and the North Channel. Dams were erected on many of the rivers so that the spring freshets would more readily move the winter cut logs into the Lake. Nearly all of the forests have been cut at least once over the past 150 years, but as time passed, nature reclaimed what was lost resulting in forest cover throughout much of the northern watershed. In southern areas of the watershed, land clearing was the first priority of early settlers. By the middle of the 19th century much of the forest and prairie soils suited to agriculture were plowed or intensively grazed. Agriculture became the primary activity with some of the most productive counties in Ontario found within the Lake Huron watershed. Many descendants of the original 19th century settlers continue to farm. Commercial fishing was one of the first industries established in new coastal communities that sprang up as Europeans settled. The lake supported a commercial fishery which has produced annual catches as high as 13000 metric tons. A dramatic decline in landings of commercially valuable species and instability in fisheries resources has occurred since the 1940s with the accidental introduction of the sea lamprey, overfishing, deterioration of water quality, and an changing food web with invasive mussels, fish and invertebrate. Beyond providing employment and economic benefits, the lake provides fundamental life sustaining services such as drinking water to approximately 1.4 million Ontarians. 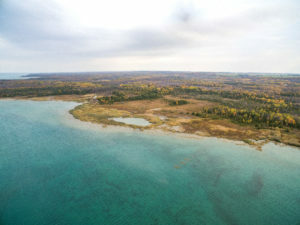 These vital ecosystem services and economic activities are entirely dependent upon a healthy watershed and lake ecosystem; however, all economic activities on land by individuals, communities, and business sectors directly influence the water quality and future health of Lake Huron, therefore we need to balance social, economic and ecological needs. Over the past 200 years, the Lake Huron watershed has experienced significant human development and ecological change. Most of the original mature forests have been logged and replaced by younger stands of mixed hardwood and softwood forests. The southernmost portion of the watershed has experienced the greatest development due to the cultivation of rich soils, intense agriculture, population growth and urbanization. 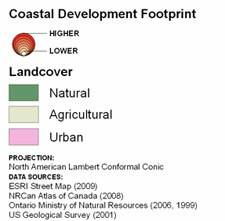 The landscape of the northern watershed has experienced less long-term development. 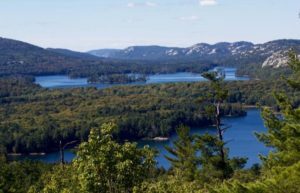 Intermingled within the northern forest, representing a significant percentage of the entire landscape, are freshwater aquatic systems (rivers, lakes and a variety of wetlands) that represent areas of high conservation value. 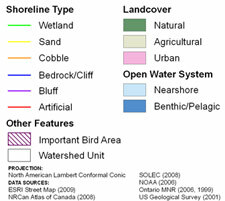 The entire watershed contains a diverse collection of habitat types across varying degrees of development, which if sustainably used and effectively conserved, will protect the ecological health and support a rich diversity of wildlife and ecological processes required to maintain water quality as it moves from the headwaters to the open waters of the lake. A healthy watershed and lake is important to everyone and everything that uses and needs water. Activities on land directly influence water quantity and water quality for future generations. Surface drainage features, groundwater seeps, and springs are the origin of small watercourses that form the basis of ecological integrity of our watersheds. 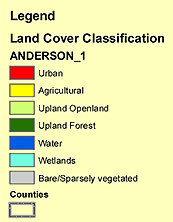 Upland areas encompass the majority of the watershed land area. Well-functioning uplands allow water to infiltrate into the soil, which minimizes stormwater runoff and reduces the probability of extreme flooding. Of the 134,000 square kilometers that make up the watershed, 40% is forested. The majority of the forested areas are Great Lakes St. Lawrence mixed-wood forests located in the northern reaches of the watershed where the landscape has transitioned to a mosaic of diverse forest community types following early settlement and intense logging. In the southernmost region of the watershed, small fragments of Carolinian woodlands support the most diverse flora and fauna assemblage of the basin. All Lake Huron forests and small woodlands provide important water quality functions such as shade that moderates stream temperature, habitat for wildlife, and protection of source waters. 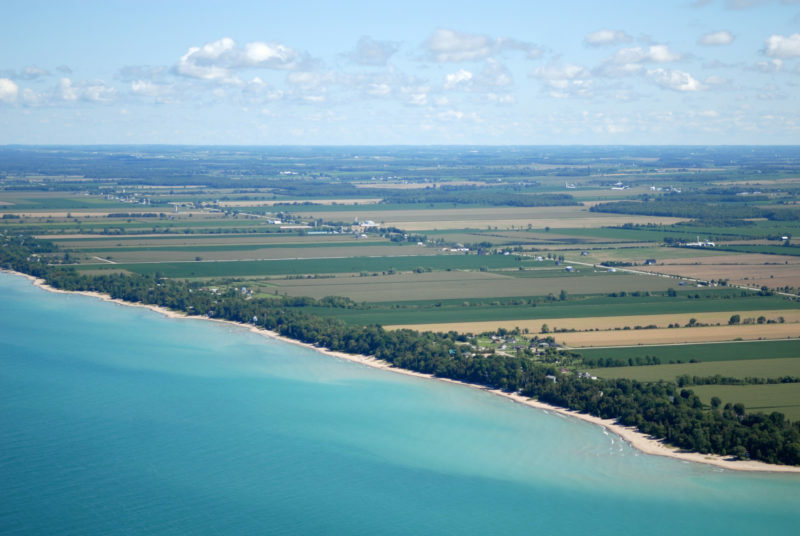 Much of the Great Lakes St. Lawrence mixed-wood plains have been converted to agriculture due to their rich soils. However, important vestiges of prairies are still found in the southern part of the watershed. The extensive root systems of trees, shrubs and plants of these vegetation communities lock soil particles together, helping to prevent soil erosion and water pollution. These sites also support a number of amphibian and reptile species as well as several species of grassland songbirds. Lakes of all sizes are found throughout the watershed. The biggest inland lake is Lake Simcoe in Ontario. Inland lakes moderate the quantity of water moving through the watershed and provide critical flood prevention services and recreational opportunities. Swamps, marshes, acidic bogs, and alkaline fens are all found within the watershed. These wetlands filter and absorb nutrients like phosphorus and nitrogen that can potentially stimulate algal blooms. Wetlands provide critical habitat, help maintain water quality, slow water movement and minimize the impacts of flooding and pollution. 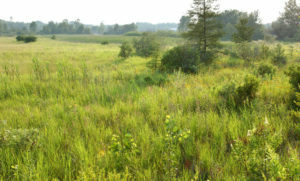 The Minesing Wetland located between western Barrie and southeast Georgian Bay is an internationally recognized inland wetland. Every creek, stream, and river influences water quantity and quality. 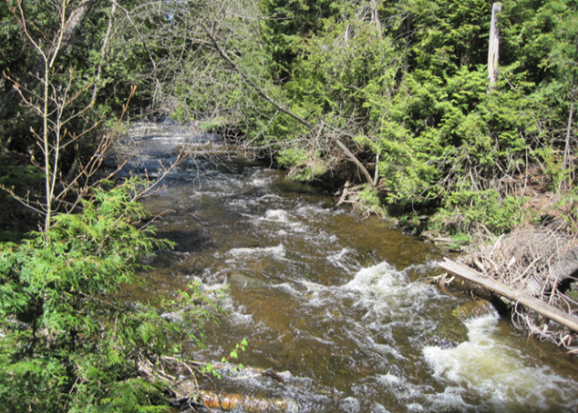 Uninterrupted connection between the lake and headwater streams allows movement and spawning habitat for one-third of Great Lakes fishes. The geology of the coast changes as you circle the lake. In the south, glacial deposits in coastal areas provide fine, white sand beaches and dunes. 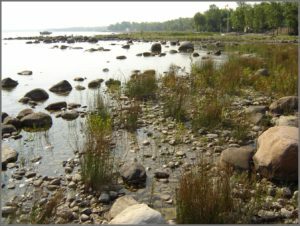 Natural and responsibly developed shorelines provide protection against erosion while also supporting water quality, a diversity of habitats and native species, and overall ecosystem health. Roughly 30% of Great Lakes coastal wetlands are found in Lake Huron, and particularly Georgian Bay. Hundreds of thousands of migratory and nesting birdlife, including at least 30 species of shorebirds, 27 species of ducks, geese and swans, and several species of terns and gulls rely on wetlands. 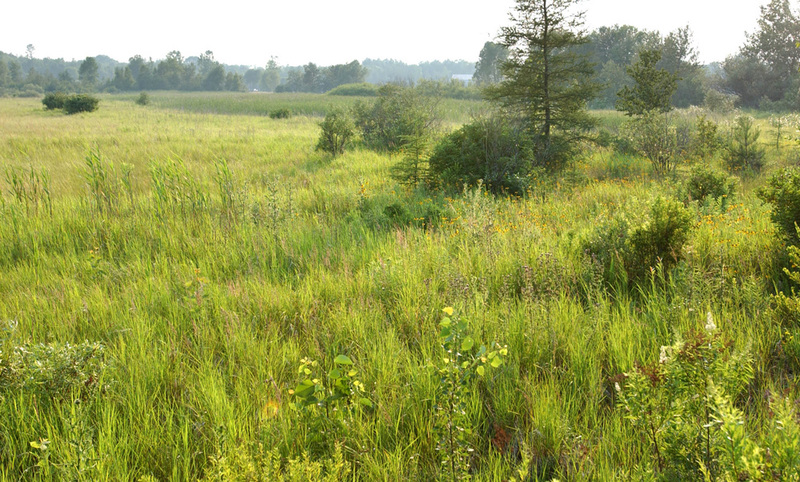 Over 40 species of rare plants and five rare reptile species are found in the coastal wetlands of Lake Huron. Fifty-nine species of fish are found in coastal wetlands and about 80% of Lake Huron fish species depend on coastal wetlands for some portion of their life cycles. Matchedash Bay located in southeastern Georgian Bay is also an internationally recognized freshwater coastal wetland. The nearshore is the hydrological and ecological link between watersheds and the open water. The shallow nearshore waters are a highly-productive environment. Virtually all species of Great Lakes fish use nearshore waters for one or more critical life-stages or functions. Nearshore waters must be restored and protected because urban and rural communities rely on this area for safe drinking water, swimming fishing and boating, as well as water withdrawals for industry and power generation. 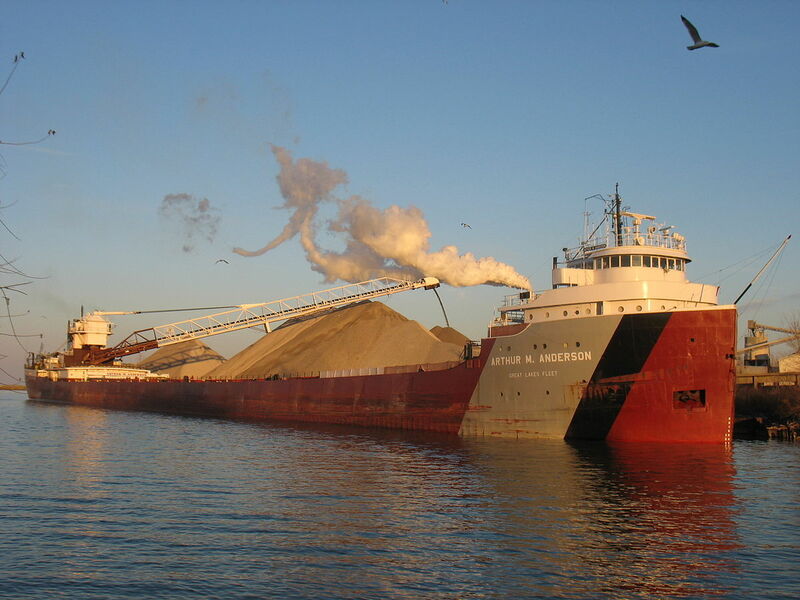 When the open waters of Lake Huron are healthy, they support a robust and resilient economy. Ongoing changes to the Lake Huron food web present new challenges for resource managers. Ecological changes that formerly occurred over decades have happened in just a few years. 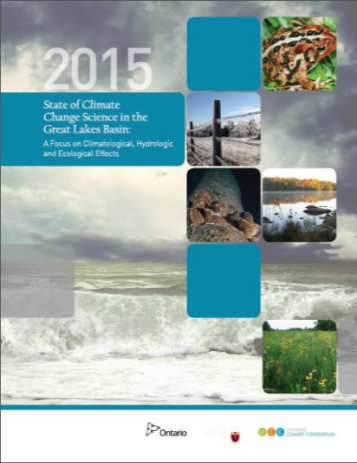 Lake Huron’s ecosystem is in “fair” condition and the trend is “unchanging”, according to the 2016 State of Great Lakes highlights report summarizing overall assessments for 9 main indicators. 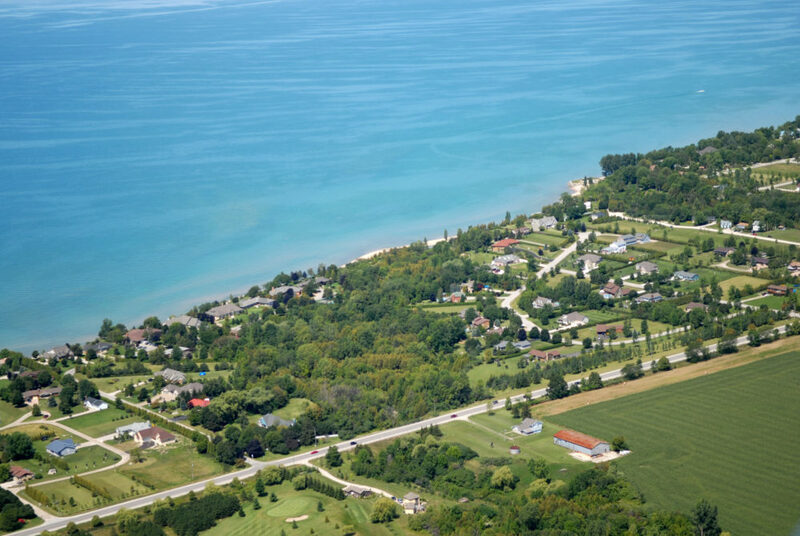 The Lake provides high quality drinking water and its extensive beaches and nearshore areas provide excellent opportunities for swimming and recreation. Chemical pollutants have declined significantly since the 1970s; however, fish and wildlife consumption advisories remain to protect human health. The majority of nearshore waters are of high quality, but areas of the southeast shore, Saginaw Bay, and parts of eastern Georgian Bay experience periodic harmful or nuisance algal blooms. Nutrient and algae levels in the offshore are variable, but largely below targets. Zebra and Quagga Mussels are associated with decline in nutrient levels and nutrient availability to other aquatic organisms, increased water clarity, nuisance algae growth and are suspected to facilitate episodic botulism outbreaks in parts of the basin. Diporeia, a major food source for prey fish, are declining, resulting in negative consequences for recreational and commercial fisheries. However, Walleye have largely recovered in Michigan waters of Lake Huron and, in the absence of the invasive Alewife, Lake Trout populations are approaching reproduction targets. 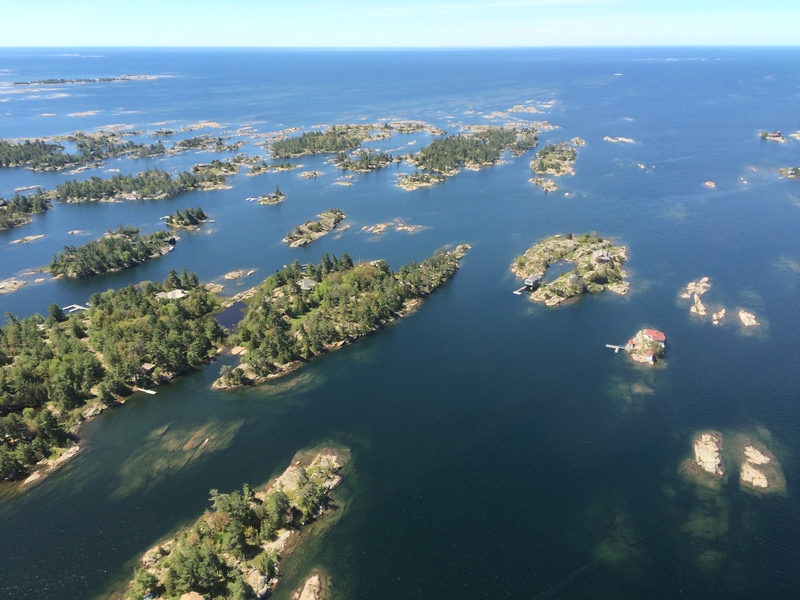 Five environmental threats with the broadest impact across Lake Huron and its watershed are the focus of resource management agencies in Canada and the United States. 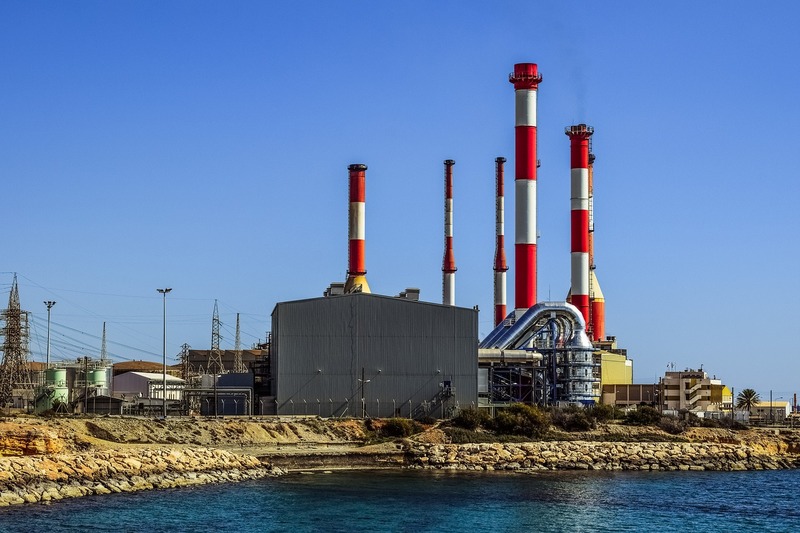 In addition to efforts focused on addressing these threats, managers are also seeking opportunities to maintain and protect the integrity of areas not yet impacted by these environmental management challenges. Water is our keystone resource and while chemical contaminants have significantly decreased since the 1970s, there are some areas with degraded water quality which can result in contaminant exposure to fish and wildlife. Consuming contaminated fish or wildlife threatens human health. Consult the Eating Ontario Fish Guide for fish consumption advice including how to identify the types and amounts of fish that are safe to eat. Consult the 2017-2021 Lake Huron Lakewide Action and Management Plan to learn more about the current state of Lake Huron regarding fish and wildlife consumption and chemical contaminants. 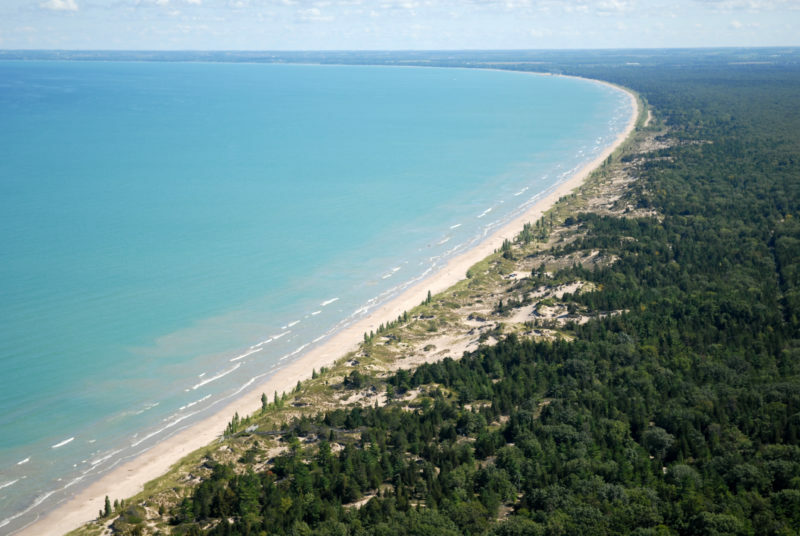 Some of the longest freshwater beaches are found in Lake Huron (Wasaga 14km and Sauble 11km) and many offer safe and high-quality swimming and recreational opportunities. 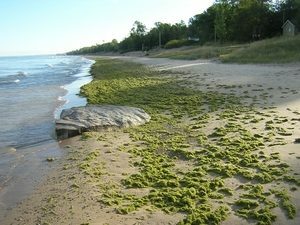 While most beaches and nearshore areas of Lake Huron are not impacted by excessive nutrients (phosphorus and nitrogen) that lead to algal blooms and bacteria pollution, localized nutrient and bacterial pollution is an ongoing issue. Inputs from household septic systems, agricultural and urban runoff and other sources (including wildlife) contribute to regional water quality challenges. Consult the 2017-2021 Lake Huron Lakewide Action and Management Plan to learn more about the current state of Lake Huron nutrients and algae. 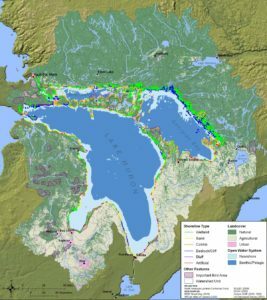 Lake Huron is an ecologically rich and globally significant ecosystem, but its biodiversity is at risk. Invasive species, climate change, water pollution, rapid and poorly planned residential and industrial growth, altered hydrology, and incompatible agricultural, fishery, and forestry practices are all having negative effects. 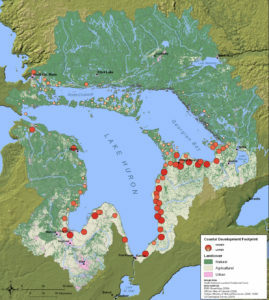 Degradation and loss of historical habitat have been identified as major stressors to Lake Huron and its watershed, particularly in southern regions. The Lake Huron Biodiversity Conservation Strategy is an international initiative designed to identify what actions are needed to protect and conserve the native biodiversity of Lake Huron. The most critical biodiversity threats and needs of the lake were determined through a collaborative, science-based process. The recommended strategies are meant to restore and conserve a functioning ecosystem. Consult The Sweetwater Sea: An International Biodiversity Conservation Strategy for Lake Huron – Technical Report. Binational, regional and place-based plans and ecological assessments are continuing to address threats to biodiversity, recommend conservation action, and implement projects to protect and restore Lake Huron habitat and native species. 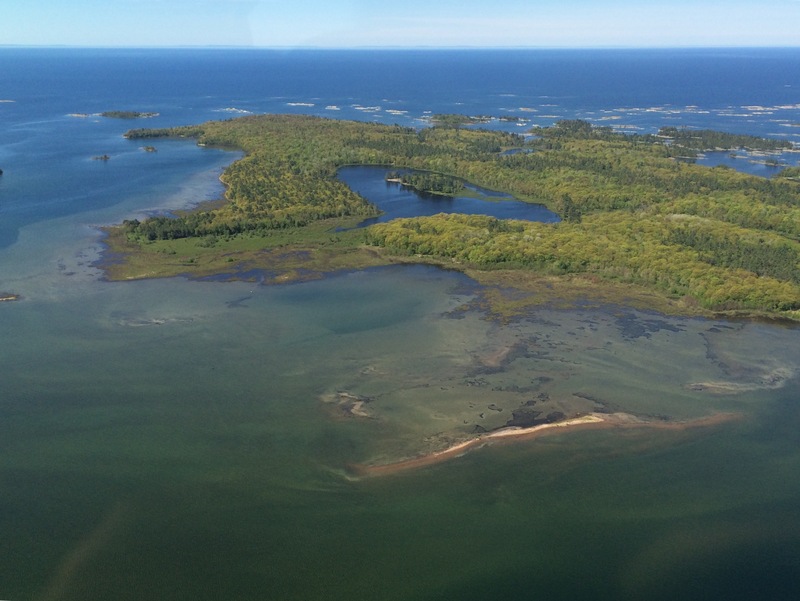 Consult the 2017-2021 Lake Huron Lakewide Action and Management Plan to learn more about the current state of Lake Huron habitats and native species. water quality and biodiversity. Sea Lamprey, Dreissenid mussels (Zebra and Quagga), Round Goby, and Phragmites continue to cause economic and environmental harm, as well as undermine efforts to restore and protect other aspects of ecosystem health and water quality. The most effective approach to reduce introduction and spread of new invasive species is prevention and targeting spreading pathways such as: ballast water, connecting waterways, illegal trade of banned species, and recreational activities such as the transport of personal boats and watercraft. Learn about international invasive species efforts and threats via the Invasive Species Specialist Group which is part of the World Conservation Union (IUCN). Access CWS’s list of invasive plants in Canada, including their biological details, environmental impacts and possible control options. 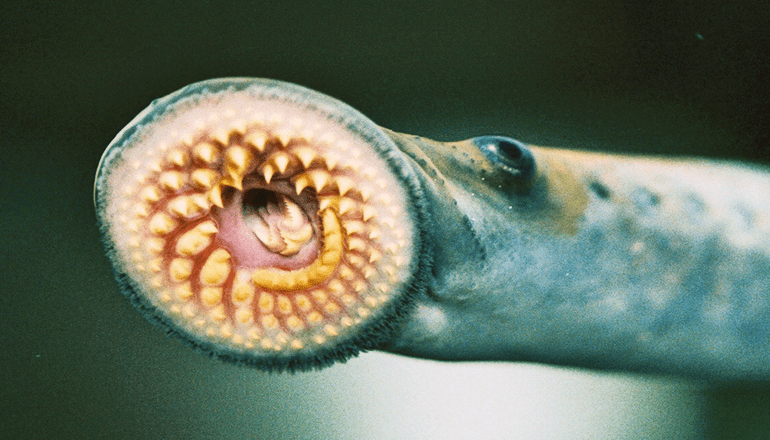 Learn about invasive species particular to the Great Lakes region. Access fact sheets and recent news articles about current and potential invaders. 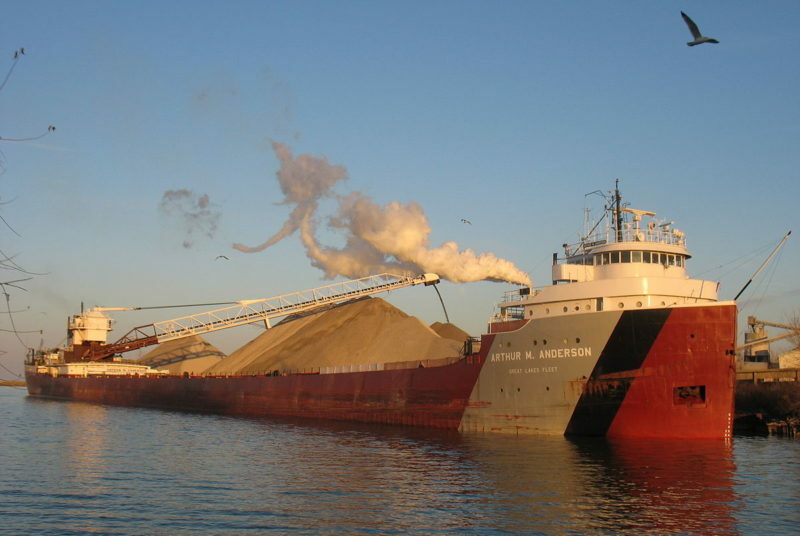 Learn about the regional effort devoted to ending the transport of invasive species via Great Lakes ships in the Great Lakes-St. Lawrence Seaway System. Consult the 2017-2021 Lake Huron Lakewide Action and Management Plan to learn more about the current state of Lake Huron invasive species. Climate change impacts such as warming temperatures, severe storm events, decreased ice coverage, and alterations to water levels are being observed across the Great Lakes basin. 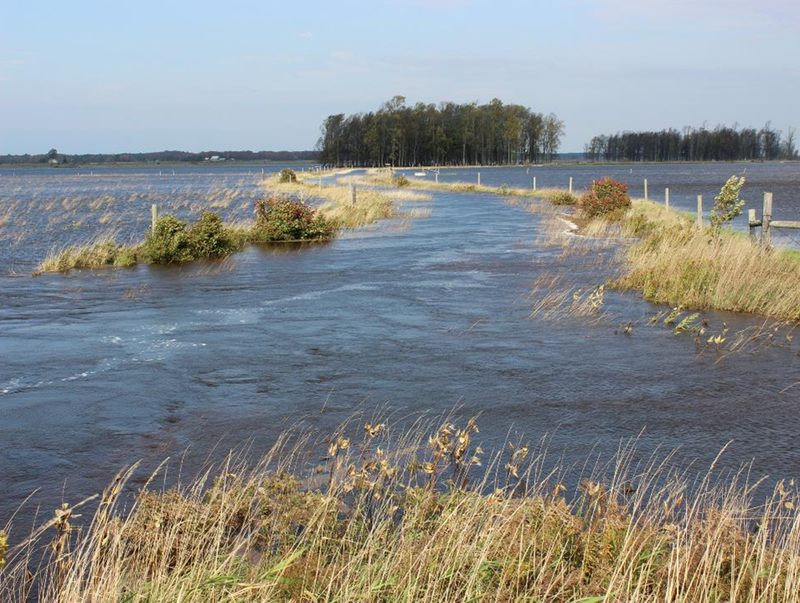 Climate change impacts physical, chemical and biological processes such as runoff and erosion patterns, nutrient cycling, and wetland development. 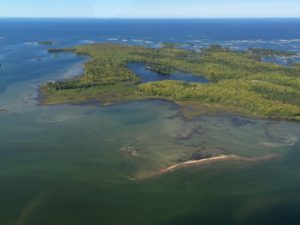 Understanding how climate change affects these processes now and in the future is important for making informed management decisions for the Great Lakes. Canada and the United States issue binational quarterly newsletters that focus on climate impacts and outlooks and a report entitled State of Climate Change Science in the Great Lakes Basin: A Focus on Climatological, Hydrologic and Ecological Effects summarizes the state of climate change impacts in the Great Lakes basin. Learn how climate change impacts everything; your weather, your food, your home, your hobbies – and what small actions you can take to be part of the solution. potential impacts of population growth and human development pressures. 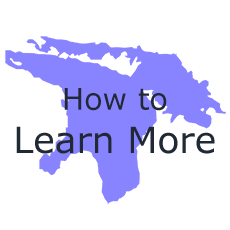 It is important that everyone in the Lake Huron watershed understand and collectively address air, land, water and fish and wildlife related concerns.